The Mid-Atlantic GeoReadiness Center (GRC), part of Naval Facilities Engineering Command (NAVFAC), receives requests throughout the year concerning the impacts of flooding regarding Navy assets. 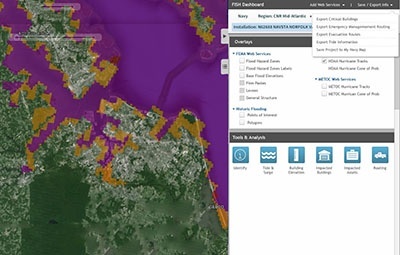 These questions typically revolve around the Federal Emergency Management Agency (FEMA) Flood Insurance Rate Maps (FIRMs), tidal surge due to hurricanes and storms, and flooding from large rainstorms. The inquiries, from various stakeholders, range from Naval Facilities planning to recovery phases of flood impacts. In keeping with the program's guiding principles of accelerating data sharing and innovation, the GRC saw fit to develop a tool that would empower users to be able to perform this analysis themselves. Effectively, the creation of a tool will save both the users, those who would have requested data or maps, and GRC time and money. The Mid-Atlantic GRC asked GISinc to gather requirements from Stakeholders across the Enterprise. This information would then be used to create a specifications document, which would begin the planning process for application development. Through many hours of meetings with stakeholders and collaborative efforts with the client, our team was able to refine conversations into concise requirements. We then used our in-depth knowledge of ESRI technology and the GeoReadiness Enterprise System to create a specification document. This will serve as a guide to ensure that the application build will run smoothly and, best of all, quickly. The beginning goal of this project was to create a tool built into the current GRX platform that would save both stakeholders and client time. Upon build completion, stakeholders will have the ability to create their own analysis without client involvement. However, the true benefit to the client and stakeholders is a deeper understanding of flooding, its threats and potential mitigation, to a given installation.